Having been born and raised in Athens, Tennessee, Josh’s small-town conservative values have been motivation in his achieving his goals of being an attorney and being a zealous advocate for individual’s rights . Josh attended McMinn County High School where he played football and baseball and graduated in 1990. In 1995, he earned a bachelor’s degree in political science from Middle Tennessee State University. 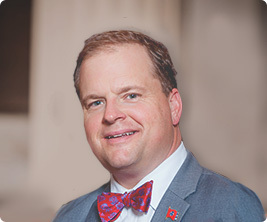 While attending college, he served as President of the MTSU chapter of Sigma Chi and is still an active member of the organization’s alumni association. After graduation, Josh attended Nashville School of Law while working full-time for the State of Tennessee as Ginseng Coordinator, at various Law Firms around Nashville, and also at Averitt Express. Josh earned his Juris Doctor in 2000. He has also attended the prestigious Heckerling Institute on Estate Planning conducted by the University of Miami (FL). Most recently, he attended Gerry Spence’s Trial Lawyer’s College in Dubois, Wyoming. He managed his own firm for a number of years in Athens, Tennessee focusing on Criminal Defense, Civil Practice, Estate Planning, and other general practice areas. Josh moved to Knoxville in 2008 and focused on a social security practice and has a wealth of experience in Social Security law having conducted over 2500 hearings in his career in many jurisdictions across the United States. Josh moved to Nashville in 2016 and has been continuing his social security practice while also handling a multitude of other legal matters. He brings a vast and diversified legal background to our firm and can handle a wide range of legal issues. Josh enjoys playing golf and road cycling. He is married, and is the son of former State House of Representatives Member Robert S. McKee and Marion ‘Honey Bee’ McKee.